For most of us Exercise Northern Plunge started back in August 2016 when the fourteen intrepid explorers of 37 Signal Regiment were despatched to Army Medical Centres to undergo fitness to dive medicals. Certified fit (and for the most part human) we were all keen for November to come while Sgt Chris Woolerton continued in the background with the organisation of the expedition. Fast forward to Saturday 19th November…..all personnel were at 33 Signal Squadron Army Reserve Centre, Liverpool, in good time, had documents checked and were efficiently bussed to Liverpool’s John Lennon airport to take the 4 ½ hour flight to Larnaca, Cyprus which was surprisingly comfortable. Upon arrival at Dhekelia Station we took over our accommodation and got some (well earned!) rest before the first day of training. 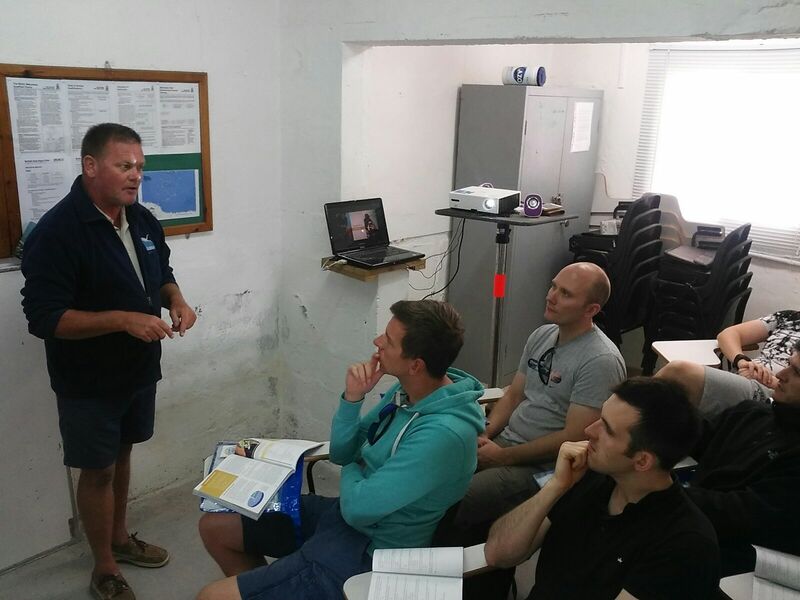 Day one of dive school began with a 2 hour drive to RAF Akrotiri to meet the dive school staff from Kembali Diving who were to be providing training and guiding for the week. The novices (or tadpoles as they were affectionately referred to) were given an overview of the course contents to whet their appetites and then they were straight into the classroom theory work. 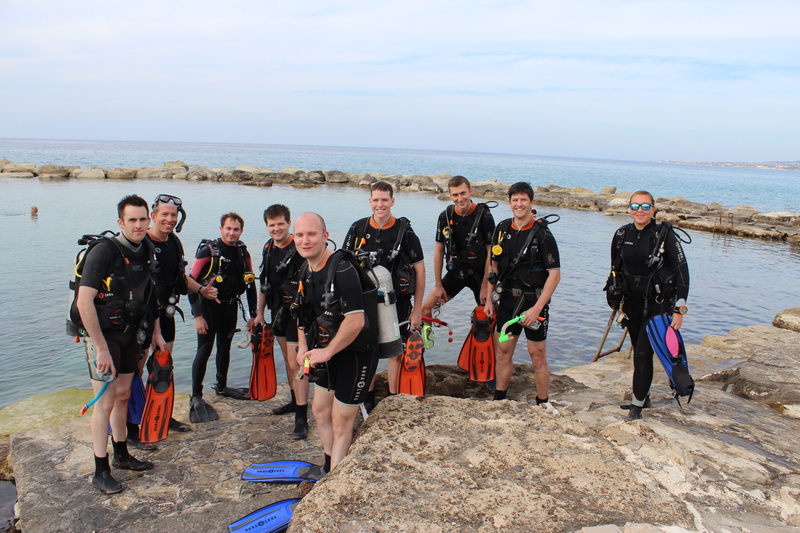 After the theory came the practice, with an introduction to the safe and correct way of handling and putting together the dive equipment (and correct names for all the bits….ie not a breathy tube thing but a snorkel etc). According to the dive school staff, normally at this time of year in Cyprus the waters in the bay at Akrotiri are dead calm and perfect for tadpole training….upon looking out of the school window it was so rough it made the North Sea look like the waters of Barbados and so another road trip was quickly organised to a calmer bay (that was unfortunately another hour away). The tadpoles finally had a chance to use the equipment for real! After setting up they followed the buddy check procedures that they had been taught and entered the water for the first time. On a purely technical note the training went well with drills being conducted to replace a dislodged mask, manage out of air situations and attempts to perfect neutral buoyancy on personal perspectives were different with most of the tadpoles marvelling at the experience of breathing underwater for the first time and a couple undergoing periods of mild (controlled) terror! Returning to the dive school saw us washing down kit, being debriefed on the day’s activities and the issue of homework. The next few days followed the same sort of format, theory sessions in the morning covering topics such as how sound and vision are affected underwater, effects of depth on pressure and air supply, how to manage your air supply and emphasis on teamwork and buddy diving. The open water sessions were increasing both in length (as our confidence and so air consumption improved) and in complexity, with drills becoming slicker as they were repeated. The last day of dive school involved a navigation exercise in a beautiful bay with crystal clear waters which also had some tunnels and other rock formations. There was limited sea life, mainly urchins and small fish but these were still brilliant to see from this underwater perspective. On the return from this dive we also did a bit of environmental work under the banner of Project Aware – collecting numerous plastic bags and other rubbish from the sea, hopefully helping, in a small way to preserve the marine environment. 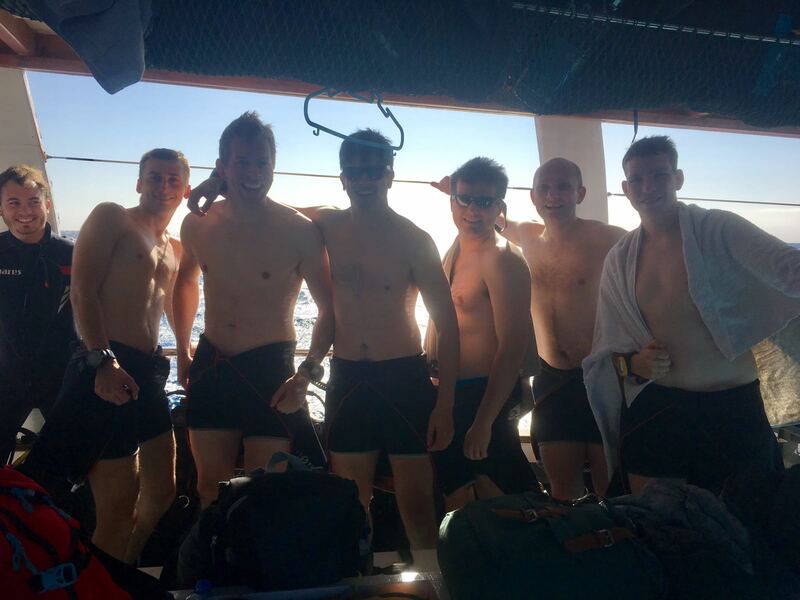 Only the final exam was left now….we all passed with flying colours and were pronounced to no longer be tadpoles…..we were fully fledged frogmen! 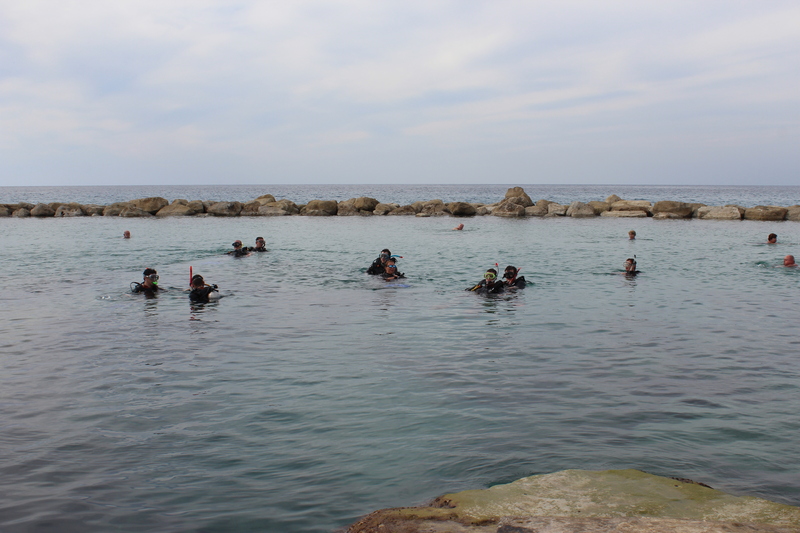 The training and qualification phase complete, we now embarked upon our first taste of ‘real diving’. The weather conditions, which had been marginal during the week were deemed to be suitable for diving the wreck of the car ferry MS Zenobia that sank on its maiden voyage in 1980. This dive was to test us to the limits, both physically and mentally, as it was our first open water dive, on a wreck from a boat! There was a 4 metre swell when we arrived at the mooring buoy which made kit preparation ‘interesting’ to say the least. After receiving a comprehensive dive brief, we completed our ‘buddy checks’ and with a ‘giant stride’ entered the water. 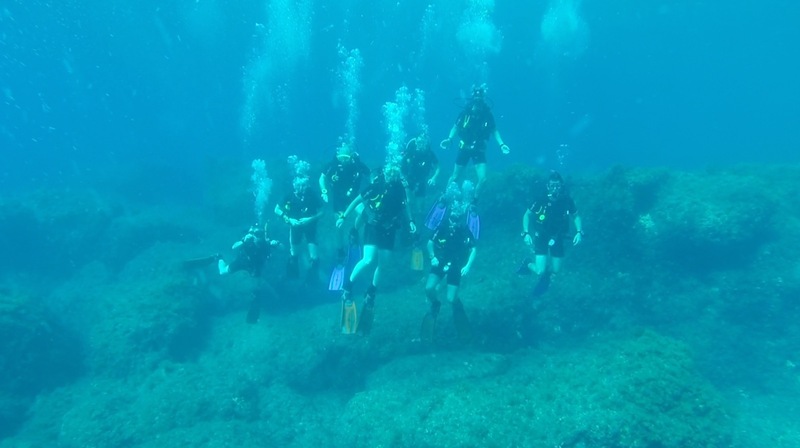 As newly qualified divers we were only able to descend to 18m but even at this depth we discovered a new world. With underwater visibility of over 20 metres we saw, from a distance, various parts of the ship superstructure – funnels and vehicles fallen from the decks, as well as fish – a shoal of barracuda, 2m long grouper and sea bream. Close monitoring of our dive computers and air supply told us after 30 minutes that it was time to surface and after completing a mandatory ‘safety stop’ we made our way back on board the dive boat, where some members of the party realised that seasickness tablets were not for the weak and vowed to purchase some for next time. This last dive proved to be the crowning glory of the trip, being newly qualified and diving on one of the 10 best wreck dives in the world as your first open water dive will take some beating. 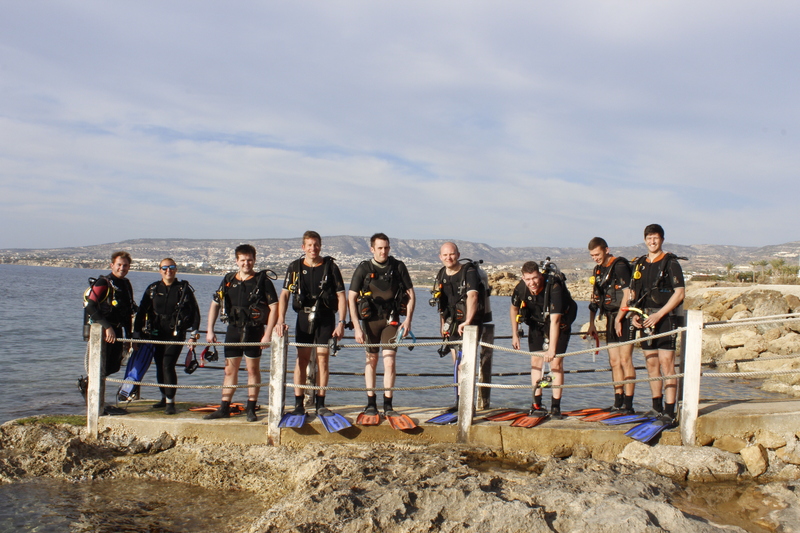 Overall the ‘ex-tadpole’ group had developed in self-confidence, teamwork and also grown as individuals during the weeks diving and for some, if not most, it has enlightened them to some of the pleasures and challenges of sport diving and hopefully opened a door to a new hobby that will last a lifetime.